An image of wildlife veterinarians fighting against the clock to save rhinos from poachers in South Africa's Kruger National Park is the first-place winner in a photography contest organized by the International Programs office in the College of Veterinary Medicine at Kansas State University. The theme of the contest was "Veterinarians Around the World." Joel Salves, a veterinary student at Onderstepoort Faculty of Veterinary Science, University of Pretoria in South Africa, won the top prize of $1,000 for his black-and-white photo, "Conservation in Motion," which captured the important role wildlife veterinarians play in protecting rhinos. According to the World Wildlife Fund, the number of rhinos poached in South Africa has increased 9,000 percent since 2007. The two runners-up in the contest had an educational theme and were awarded $500 cash prizes. "Afternoon recess" was taken by Jamie Neufeld, veterinary student at Western College of Veterinary Medicine in Saskatoon, Canada. Her photo shows schoolchildren in Uganda captivated by interns from Veterinarians Without Borders, who are taking a blood sample from a goat that just happens to be sharing the students' soccer field. 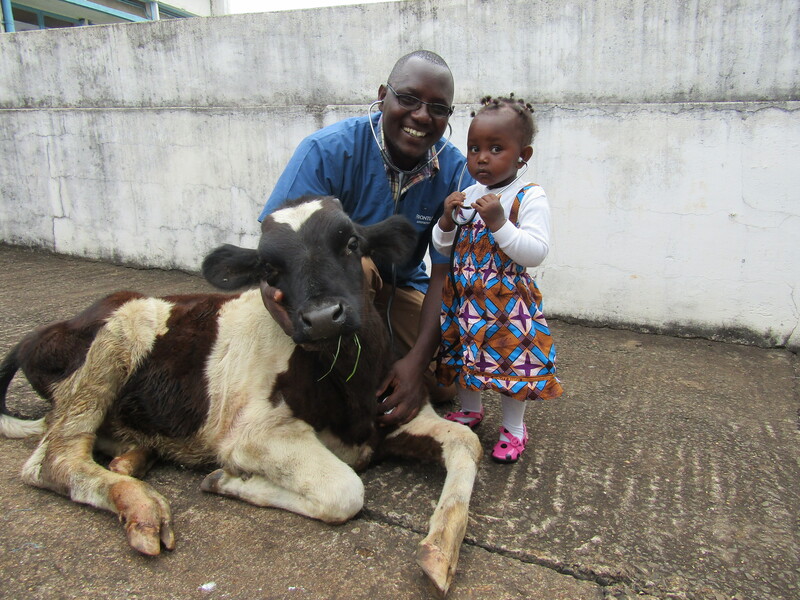 Peter Kimeli, a postgraduate student at the University of Nairobi in Kenya, took the photo "Taking Charge of Our Future: A Vision for Veterinary Professionals," which features his young daughter, who is helping him examine a calf. The winners come from a total of 240 different photos that were submitted by students from 35 countries across the Americas, Europe, Asia and Africa depicting animal health, One Health, wildlife conservation, food safety and food security. Entries were judged by a multidisciplinary panel on the criteria of eligibility, originality, style, context and quality of photograph. The top 12 photographs will be published in a calendar with an acknowledgement to each photographer. "We are delighted with the number of entries and by the quality of the photos," said Keith Hamilton, executive director of the College of Veterinary Medicine's International Programs office. "As we had hoped the images highlight the diverse work of veterinarians in different countries." Entries were open to students pursuing a veterinary, undergraduate or postgraduate/graduate degree from anywhere in the world. For more information, Contact the Office of International Programs at international@vet.k-state.edu or 785-532-4685.